Demand Response is a temporary change in electricity consumption by Demand Resources in response to market or reliability conditions. Demand Resources are loads or aggregation of loads capable of measurably and verifiably providing temporary changes in consumption. Today demand response today is largely invoked when there are imminent brownouts or blackouts and the programs are triggered by reliability trigger of some kind. Legacy technology focused on large commercial and industrial loads is being replaced by new smart grid, internet based technology that can reach residential consumers as well. According to December 2015 report by the Federal Energy Regulatory Commission (FERC), potential peak reduction from wholesale demand response rose slightly in 2014 to 28,934 MW, a 0.5 percent increase from the previous year, and accounted for 6.2 percent of peak demand in 2014, essentially unchanged from 2013. Since 2009, potential peak reduction from demand response in wholesale markets has increased by approximately 6 percent, but peak demand has also increased by a similar amount, resulting in little net change in the contribution of demand response to meeting peak demand. Nationwide, total potential peak reduction from retail demand response programs decreased by 1,408 MW between 2012 and 2013, a drop of 4.9 percent from 28,503 27,095 MW. According to GTM Research, demand response was a $1.4 billion market in the U.S. in 2015. Still, that's just a fraction of the 38 to 188 gigawatts of demand response capacity that the nation could harness to reduce overall peak energy use by as much as 20 percent, according to a 2009 report from FERC. According to data from the Energy Information Administration (Data Sets Form EIA-861 Advanced Meters ), In 2013, 51.9 million advanced meters were operational nationwide out of a total of 138.1 million meters, indicating a 37.6 percent penetration rate. This represents significant growth over 2012, when EIA reported that 43.2 million advanced meters were operational out of a total of 145.3 million customers, representing a 29.7 percent penetration rate. In 2014, advanced meters grew a further 12.7% to 58. 5 million with a 40.7% penetration rate. Smart meters are a prerequisite for a smooth, advanced demand response system. According to Navigant Research, global Commercial and Industrial DR capacity is expected to grow from 30.8 GW in 2014 to 196.7 GW in 2023. Just a couple years ago, they forecast 132.3 GW in 2023 so the market looks brighter now. In January 2016, the US Supreme Court (SCOTUS) ruled in a case that has had the clean energy community biting its nails since 2014. In October 2015, the court heard arguments about how demand response is compensated in wholesale electricity markets. On January 25, 2016 SCOTUS ruled in favor of the Federal Energy Regulatory Commission (FERC), deciding that demand response should be regulated at the federal level and ensuring that the U.S. demand response industry can continue its impressive progress. The decision is also a victory for consumers, because by allowing compensation for DR customers at wholesale rates, DR saves money for the grid as a whole as well. From the court’s opinion: “[demand response] will put ‘downward pressure’ on . . . the rates wholesale purchasers pay. Compensation for demand response thus directly affects wholesale prices. Indeed, it is hard to think of a practice that does so more.” And those wholesale purchasers (i.e., the utilities that sell electricity) pass these savings on to their customers. Financial markets immediately took notice of the impact of this decision on the business opportunity for clean energy; EnerNOC, an established DR company, saw its stock price rise 65% in the day following the court decision. It has come down some since, but still remains more than 25 percent above its one-month average prior to the SCOTUS ruling. Ancillary Services DR (My Blog Article) - End-use customers are allowed to bid load curtailments in ISO/RTO markets as operating reserves. Accepted bids are paid the market price for committing to be on standby. In order to participate in ancillary-service markets, end-use customers must be able to adjust load quickly during a DR event. 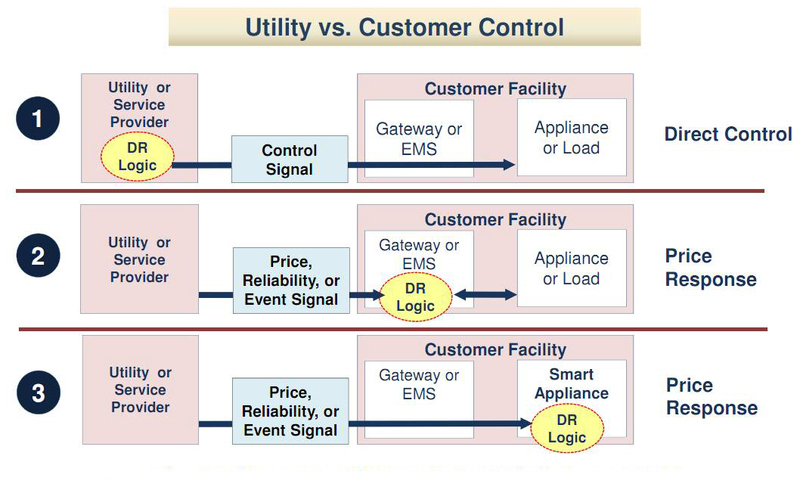 Emergency DR (My Blog Article) - The emergency demand response option provides incentives to customers for reducing load during reliability triggered events. These events may also be called in response to high wholesale electricity prices. End-use customer participation in this option is most often voluntary. Upon notification, customers can choose not to curtail and in turn not receive any payment. Usually on-site generators are allowed to participate and supply power during curtailment periods. Capacity Market DR (My Blog Article) - Typically offered by wholesale market providers such as ISOs and RTOs. Participants commit to provide pre-specified load reductions when system contingencies arise. In return, they receive a fixed incentive payment in the form of capacity credits and are paid to be on call even though actual load curtailments may not occur. Enrolled loads represent a firm resource and can be counted toward Installed Capacity (ICAP) requirements. DSM - Demand Side Management - Includes two components: energy efficiency (EE) and demand response (DR). EE is designed to reduce electricity consumption during all hours of the year, attempting to permanently reduce the demand for energy in intervals ranging from seasons to years and concentrates on end-use energy solutions. DR is designed to change on-site demand for energy in intervals from minutes to hours and associated timing of electric demand/energy use (i.e. lowering during peak periods) by transmitting changes in prices, load control signals or other incentives to end-users to reflect existing production and delivery costs. Demand Flexibility - Unlike wholesale demand response, demand flexibility interacts with granular retail rate structures (such as real-time pricing and demand charges) and leverages simple technologies such as smart thermostats and grid-interactive water heats to shift demand across the hours of a day. Having both options available—demand response allowing customer resources to participate in the wholesale markets and demand flexibility allowing customers to respond to retail rates—is likely to lead to the lowest-cost outcomes for customers and the grid. Demand Response Aggregator- A company joining two or more customers, other than municipalities and political subdivision corporations, into a single purchasing unit to negotiate the purchase of electricity from retail electric providers. Aggregators may not sell or take title to electricity. Dispatchability of DR Options - The ability to provide a DR-inducing signal within a limited timeframe. Some argue that dispatchability is a requirement of a DR option. Time-of-use (TOU) rates are sometimes considered a demand-response option. TOU rates are non-dispatchable and produce a consistent reduction in peak demand. A Smart Grid is a key enabler in achieving demand response / load management; with the goal of peak reduction. The extensive use of demand response could potentially cut the peak power demand in the United States by up to 20% in the next decade, according to a 2009 report from the Federal Energy Regulatory Commission (FERC). This study estimates the potential growth of DR in the United States from 2009 to 2019. Four different scenarios are considered (from least to most potential) – Business-as-Usual (BAU), Expanded BAU, Achievable Participation and Full Participation. Demand response gives utilities the ability to cut large commercial and industrial loads and to control other customer's use of air conditioning, refrigeration, and other large electrical appliances. For instance, demand response could cause your air conditioner to delay its next cycle or to cycle less often in times of high demand, usually in exchange for a credit on your power bill. More sophisticated means of demand response include the use of smart meters and "dynamic" utility pricing that varies with demand, so that customers are motivated to reduce or delay their electrical use during times of peak demand. 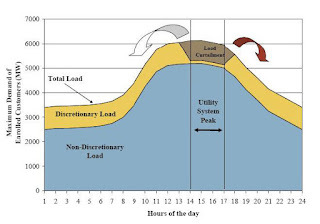 Looking ahead to 2019, the FERC report projects a 38-gigawatt (GW) reduction in peak load under business as usual, equal to 4% of the projected peak load; an 82-GW peak load reduction under expanded business-as-usual, equal to 9% of peak load; a 138-GW peak load reduction under the achievable participation scenario, equal to 14% of peak load; and a 188-GW peak load reduction under the full participation scenario, which yields a 20% reduction in peak load. 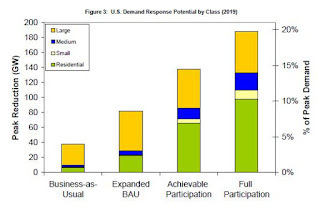 The full participation scenario results in essentially no growth in U.S. peak power demand over the next decade. In this scenario, much of the load savings is achieved through dynamic pricing, combined with smart devices. There are three necessary components for demand response. Price and Event Communication - Information is necessary for customers to take action and the rates provide the motivation to respond. Enabling technology allows residential and small commercial/industrial customers to respond to price easily. Save Costs– The Galvin Institute estimates that widespread national use of demand response would save U.S. consumers at least $30 billion a year. For example, Chicago’s Community Energy Cooperative initiated a demand response program that saved the residential consumers an average of 19% on their electricity bills in 2003. Reducing spikes in demand will cut the need for peakers small power plants such as pumped storage systems that exist solely to deal with such spikes. Increase Consumer Choice - Introduce new markets for aggregators, micro-grid operators, distributed generation, vendors, and consumers; Engage the consumer by allowing market participation and consumption/billing choices. Manage Demand - Control peak power conditions and limit or remove brownout/blackout instances; Flatten consumption curves and shift consumption times; Maximize use of available power and increase system efficiencies through time-of-use (TOU) and dynamic pricing models. Improved Planning - Demand Response can be considered in long term planning exercises as a supplement to long-term planning reserves, and provide operational reliability through operating reserves and flexibility. Reduced Capital Requirements - Demand Response resources can be used to manage the risk associated with construction and operations of traditional supply-side resources. Support Intermittent Renewables - Demand Response resources can be used to manage the risk associated with a variety of new operating characteristics associated with variable renewable resources. However, no vendors are currently offering a full-service platform to manage both demand response and on-site generation, which limits the option in the short term. DG integration is a very smart way for DR to expand, but utilities shouldn't be asking for full-blown DR-DG platforms from vendors yet. They simply don't exist. Industry Structure Will Change - Demand response companies could face pressure from providers of technology that lets utilities turn down peak power use by themselves. Or those demand response aggregators could take over that market. The longer-term promise of two-way communicating smart meters to could replace demand response systems from aggregators like EnerNOC and Comverge with hardware and software the utilities can own and operate on their own. And if two-way networks that allow customers – particularly homeowners – to play a part in deciding when their air conditioners power down become more widespread, that could pose a serious threat to demand response aggregators middleman role. Unproven Benefits - The Demand Response cost savings that are included in advanced metering rate cases are still mostly theoretical. We don’t know for sure if demand response will be critical to making Smart Grid cost effective. Customers are being paid cash for lowering peak usage against a baseline that, of course, by definition is unobserved. So it has to be estimated and there you have a lot of statistical methodology questions. Dispatchability - Smart meter-enabled systems for turning down customers' power use may spread in the coming years and decades, but that they could continue to suffer from the potential for customers to opt out. That would make their negawatts a bit less like the firm generation resources like coal-fired power plants, and more like solar power – a fair-weather resource, so to speak, that can be relied on only when the sun is shining, or in this case, when those CFO-less and CIO-less homes are willing to agree to turn down their power use. Today close to 80% of the demand response in California is only available in an emergency. About 1700 megawatts, that's a significant resource, only available in emergencies. 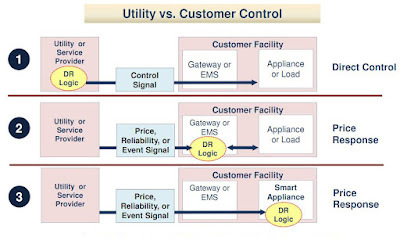 Because it is intended for emergencies, the ISO cannot plan around or even consider DR.
Complex Information Exchange - Demand Response is characterized by interactions between the actors that must traverse many domains in order to function. Information is exchanged between devices of varied complexity, ownership, and access rights. High Cost - Current Cost to install DR is too high. First cost and on-going operations/maintenance cost make few DR programs economic. Communications. Demand response creates new communications needs. At a minimum it will be necessary to communicate real-time prices and/or interruption signals. But the Internet creates the possibility of a much richer dialogue between end-users and the system operator. In addition to prices, the kinds of information that may be communicated include total end-user loads, end-user loads available for interruption, billing information, and forecast of weather and prices. A variety of issues need to be addressed including communication protocols, security and reliability. Controls - A key to more successful demand response programs, especially in buildings, will be the availability of control systems that can respond automatically to price and interruption signals. Existing control systems for buildings have a number of deficiencies and R&D efforts are required to overcome these deficiencies. Institutional issues - Some observers argue that the most important impediments to successful demand response programs are institutional (as opposed to technical). While there are a few successful RTP programs in the US, there have also been a number of failures. Use of Backup Diesel Generators for DR - On May 22, 2012, the EPA signed proposed amendments to the National Emission Standards for Hazardous Air Pollutants for stationary reciprocating internal combustion engines (NESHAP RICE). The proposed rule changes do not become effective until EPA issues a final regulation including any final changes. Opponents including the Sierra Club want to see backup diesel generators restricted to true emergencies, where they have always been exempt from pollution controls. The EPA’s proposed rule restricts operation for emergency DR to the lesser of program requirements (which is 60 hours in PJM) and 100 hours per year. The EPA has always allowed up to 100 hours per year for non-emergency use, which includes testing and maintenance, and a subset of those hours for emergency DR. The EPA is proposing more flexible as to how those hours can be used in order to maintain last line of defense emergency resources to help prevent blackouts. It’s important to keep in mind that these generators – at hospitals, wastewater treatment plants, and other mission critical facilities – must run periodically for testing and maintenance, and existing permitting rules limit such operation to 100 hours per year. DR event hours can and are used as substitutes for normal testing and maintenance. Also, EPA is proposing to tighten the trigger for when emergency DR events can be called (i.e., at NERC EEA Level 2 - Issued when a Control Area “foresees or has implemented procedures up to but excluding interruption of firm load commitments” and voltage reductions only); thus, emergency DR is very rarely called. The last, and only time, emergency engines have been used by ISO New England for emergency DR, for example, was on August 2, 2006 for a total of 3.75 hours. If emergency DR was not available that day, the grid most likely would have failed; and if that happened, every generator, whether properly permitted or not, would have operated for hours or days before the electric grid was restored. Falling Prices - Traditional business models for demand response are facing pressure, with prices on a slow but steady decline in key markets like the one operated by mid-Atlantic grid operator PJM. In one sense, that’s a function of the industry’s success -- as more and more megawatts of demand-side management come on-line at increasingly competitive prices, the overall effect will be to lower the cost of serving those peak demand moments on the grid, and thus lower the payments that providers can earn. Unstable Demand Response Revenue - From a business-model standpoint, EnerNOC aims to diversify away from its hugely seasonal business (100 percent of EBITDA and 70 of percent revenue come in Q3) with increased software sales and non-Q3 DR revenue. Constellation Energy - (former NYSE ticker symbol CEG), headquartered in Baltimore, Maryland, was an energy producer, trader, and distributor. The company operated over 35 power plants in 11 states. In March 2012, Constellation merged with Exelon, with Constellation Energy taking the Exelon name and the corporate headquarters moving to Exelon in Chicago, Illinois. Comverge Norcross, GA- With over 500 U.S. utility clients and 4.5 million devices installed, Comverge "smart megawatts" technology is widespread and in use across the nation. Their "pay-for-performance" programs provide capacity that can reduce emissions, eliminate line losses, increase reliability, and defer generation and transmission acquisition. The company operates in two segments, Residential Business and Commercial and Industrial Business. The Residential Business segment offers IEM solutions for residential and small commercial end-use participants. Its solutions include IntelliSOURCE software that provides demand management functionality enabling control of various end-use devices and systems, integration into the utility customer’s back office operational systems, and inter-operability with advanced metering infrastructure, as well as offers a two-way real-time communication link to residential customers; a suite of intelligent hardware comprising one-way load control switches, smart thermostats, and in-home displays; and services, including installation, marketing, and program management. In April 2007, Comverge (COMV) became one of the first publicly traded companies that could be described as a pure-play smart grid company. In March 2012, Comverge ended that experiment on the public markets with a sale to H.I.G. Capital for $49 millionon, a fraction of the market value it commanded just 18 months before. Comverge has worked with hundreds of electric utilities to deploy nearly six million energy management devices and enroll more than two million residential customers into mass-market demand management programs. According to a July 2015 Leaderboard Report from Navigant Research, Comverge and EnerNOC now lead the DR provider market in terms of strategy and execution. CPower - Baltimore, MD - In October 2014, Constellation Energy and Comverge announced they’re forming a new company that will combine their nationwide portfolios of C&I demand response. Constellation holds a minority stake in the new company, while H.I.G. Capital, the company that took Comverge private for $49 million in 2010 and has run it since then, will hold a majority stake. The combined business operates as a new standalone company, independent from Comverge and Constellation. CPower specializes in delivering a full spectrum of demand response offerings to commercial and industrial customers across the United States. The the combined forces have more than 2,269 MW under management at more than 1,700 C&I customers at 7,700 sites nationwide . Eaton Corp, Houston, TX - In May, 2012, Eaton Corp., the power and control systems giant, announced that it would acquireCooper Industries, catapulting the 90-year-old Eaton into a new class of smart grid competition. ; Cooper Industries engineers and manufactures medium- and high-voltage electrical equipment, components, and systems that deliver reliable electric power to homes, industries, businesses, and institutions worldwide. Through their Energy Automation Solutions group, which includes Cannon Technologies and Cybectec Inc. they are also a leader in providing software, communications and integration solutions that enable customers to increase productivity, improve system reliability, and reduce costs. Terms of the transaction set a value of $72 per share of Cooper stock in cash and shares in the new company, for an equity value of $11.8 billion, one of the biggest M&A deals of the year so far. Eaton has secured a $6.75 billion bridge financing commitment from Morgan Stanley and Citibank to finance the cash portion of the acquisition. EnerNOC (NASDAQ: ENOC) Boston MA - A leading demand response and energy management solutions provider for commercial, institutional, and industrial customers, as well as electric power grid operators and utilities. EnerNOC, the country’s biggest ;DR provider, has between 24,000 and 27,000 megawatts of peak load under management, according to its website. Enernoc has built a large network of customers who would adjust demand by turning down air conditioners or lighting when EnerNOC asked them to, and EnerNOC would then bid that potential energy savings into competitive wholesale markets, primarily PJM. In October 2014, , Constellation Energy and Comverge announced they’re forming a new company that will combine their nationwide portfolios of C&I demand response. Constellation holds a minority stake in the new company, while H.I.G. Capital, the company that took Comverge private for $49 million in 2010 and has run it since then, will hold a majority stake. The commercial and industrial customers making up Comverge’s portion in the new business come from the portfolio of Enerwise Global Services, acquired by Comverge in 2007. Meanwhile, Comverge itself will retain its residential and small commercial demand response business, which it does as a turnkey service or under contract to utilities. That part of Comverge’s business accounted for about three-fifths of its revenues when H.I.G. took it private in 2012, though the company hasn't disclosed any details on its market share or split between business units since then. EnerNOC reported record revenues of $471.9 million for 2014, up 23 percent from the previous year, largely driven by growth in its mainline demand response business in markets from mid-Atlantic grid operator PJM to Australia and Europe. Profit shrank on a non-GAAP basis to $36.3 million or $1.26 per share in 2014, down 19 percent from $44.9 million and $1.55 per share in 2013. The business has grown rapidly as it built out demand capacity, but the court battle leading up to this ruling took its toll on the company. If the Supreme Court had ruled the other way, it could have undermined EnerNOC's entire demand response business by stripping FERC's power. NRG Energy, the generation and retail energy giant, has also been making moves into demand response, buying Energy Curtailment Specialists in 2014 to bring more than 2,000 megawatts of C&I load under its control. 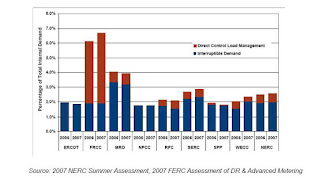 FERC - 2009 ASSESSMENT OF DEMAND RESPONSE AND ADVANCED METERING - This report fulfills a requirement of the Energy Policy Act of 2005 (EPAct 2005) section 1252(e)(3)1 that the Federal Energy Regulatory Commission (FERC or Commission) prepare and publish an annual report, by appropriate region, that assesses electricity demand response resources. EnergyDSM.com - This website was created so people can come discuss and learn about energy demand side management. CBP - Capacity Bidding Program - a statewide program operating in the territories of all three IOUs. AMP - Aggregator Managed Portfolio - offered by PG&E. DRC - Demand Response Resource Contracts - offered by SCE.